Star Trek Is LIVE & Tiny Matt Is Here For Q&A! Thanks to all our Amazing Readers that joined the Q&A. I love the Community involvement. Thanks so very much to Matt @ TinyCo too for taking the time out of his very busy schedule to spend some time personally with our Amazing Readers. Android users: Download the 1.7.3 update from the Google Play store for bug fixes! Are you boldly going out of your mind yet? So much going on in the game, so many cool things, cool Characters, you just do not know where to look? Want a lil more help? 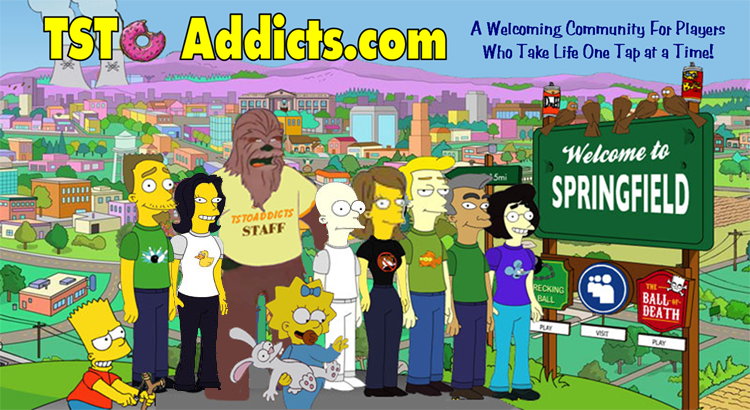 You already know that we Addicts LOVE to help you out, but you know who else loves to as well? TinyCo! Matt from TinyCo has graciously offered to moderate your comments on their AMAZING Star Trek Event. He will be bouncing in n out of the comments section of this post offering answers to your questions. So feel free to get your Vulcan mind meld going with him and ask away. Please keep the focus to the Event and keep with our Guidelines. 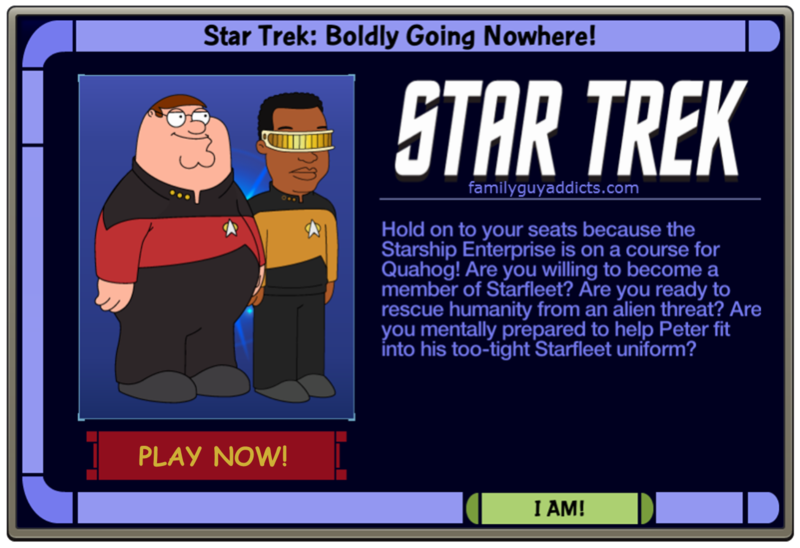 This entry was posted in Game Play, Special Event, Tips and Tricks and tagged Family Guy Addicts The Quest For Stuff, Family Guy Star Trek Event 2015, Family Guy Tips and Tricks, Questions for TinyCo, Star Trek Event Questions, TinyCo Q&A. Bookmark the permalink. These questions are outside of the Star Trek event, but still game-related. 1. I know about the character New Brian from FG0705 – “The Man with Two Brians”. Any chance that you may add him to the game? And, if he does appear, is his voice actor, John Viener, going to record some new lines for him? 2. Are you guys planning on adding some of Vinny’s lines from FG1208 – “Christmas Guy” for him to use, like “Come on, I went through a lot of trouble” and “Oh! This is a twist I did not expect”? 3. Speaking of Vinny, can you add his classy costume from “Christmas Guy” for him to wear? Is Worf a playable character in the game? I don’t see him anywhere, it’s kinda messed up that they would put him on the title screen when he’s not even in the game. Can someone help and advise me if I’m doing something wrong or there is a bug Ive found with the iPhone 6 plus as I’ve done the task with bonnie now twice getting the green gems and when going to enterprise to unlock engineering it’s saying I have 0/2 but I’ve got 2 !!! Where is it going? Hoping the Enterprise is still available after the event ends. Would be pretty cool if TinyCo used the same system to make building interiors, or at least the Griffin house, accessible in game… similar to the Flintstones game. Wish it didnt take like 4 days to update core. Not much to do while you wait for that. Otherwise update is really cool. I am only getting tribbles on my Enterprise and no longer in my Quahog streets. Is this a glitch or the way it was changed? Make sure you have enough memory to run the game left on your device. This game requires a LOT of it. What exactly happens to the enterprise after the event? Does it disappear or do we get a chance to visit forever. I’m asking it so I’d know if I should put more focus to the decorative side or productive side. I’m still waiting to unlock Riker. He’s been standing for days, waiting on Tribbles. I’ve updated, reloaded, and emailed Tinyco. Sigh. I want to board the Enterprise. Any one else having issues? Soooo, I was reading in the FAQ and I want to know if I read it correctly. At the end if the event we get ‘a decorator version’ of the rooms we created? Like the rooms we got for the Valentine’s event that just take up valuable real estate? My next question. How hard would it be for Tinyco to keep the Enterprise as a functioning multi-verse? It has no interference with the event area, whatsoever. It is almost a stand alone gaming feature. I would rather that it stay as a permanent fixture than to get the decos at the end of the event. Tinyco’s has gone through so much effort and the detail is so rich, there are 1000’s of fans out there wanting this, why not make it a permanent feature? Call the event a ‘Beta test’ if you will. 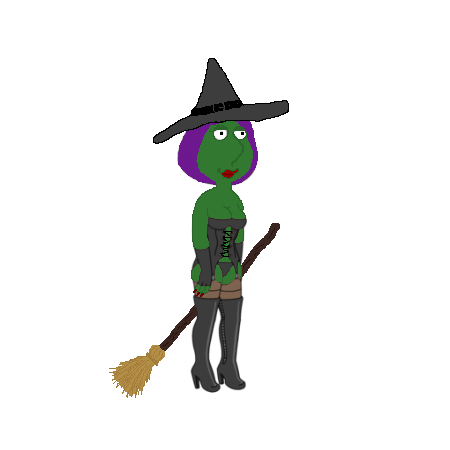 Usually the costume can be stored in your inventory until you unlock Stewie. Tiny Matt… Why is this event not released on windows phones???? Read the comments below…he’s answered that. Twice. Hoping that in the future, there will be ONE button that automatically collects all coins. I am spending way too much time in the game just collecting these coins, please help! So… I finally got the plutonium to send finish getting Olivia on the same day that the event started. My blimp left and never came back. How poor Olivia is sitting there unlocked. Anyone else have this problem? Just acquired enough to get Ferengi Mort…and now he’s missing from the replicator? Whiskey Tango Foxtrot?! Hard close and restart the game a couple of times, he should still be there. I built the Cargo Bay but after it finished it looks like the Crew Quarters and says it’s the Space Crapper. Just wondering who was the genius that decided to put a required 20 hour task for an item on the same character that is the only one that drops a required item for a costume. Sorry if I missed it, but does anyone know if there will be an event currency box again? Like Christmas and Valentine’s. I would like one if it offered missed items or perhaps some exclusives. I bought a Dilithium mine but I’m reluctant to buy Enterprise rooms for clams because they are quite expensive and I would rather spend the rest of my clams on characters/skins. Would be nice if it would let us get Enterprise rooms we didn’t build by the end. Usually they have them, but not until the last week or so of the event. OK thanks, I managed to get most items from Valentine’s Day, so I just really wanted to get them from this event because it seems like a lot more fun! It’s also understandable but a shame that we couldn’t keep the Enterprise. Personally I wouldn’t mind a larger save file if it meant keeping it the way that we will have customised it. I would love to have a shuttle to visit ours when we like, like Krustyland in Tapped Out! Since the event started my store wont open. Consuela pops up talking about an error and My Event Level hasnt even appeared yet so idk were my exp is goin. Any idea whats going on? Have you tried the basic troubleshoot methods? I’m finding myself hanging out on the Enterprise a lot because of the music change. Can we get new music for all events? Between events can obviously have the original music, but (even if it is a sound-alike so as to not have to pay royalties) it would be nice to have spooky music for Halloween, demented circus music for the Amer. Horror Story Freak Show event, etc. games like Angry Birds change their music often. It would be a nice change. (And it doesn’t cost much to hire a composer to create a create a 1 1/2 minute loop now and then). Thanks, Matt, for taking this into consideration! I was just wondering “Joey” mentioned an American horror story event. Is this something that already happened or something that might or will happen in the future? Or is it something “Joey” just wants to see. I have been playing since a little before valentines day so I’m pretty new. I am finding I don’t love this game as much as another game I like to play but I love AHS and would be very interested in an event based on that amazing show. Thanx and have fun. Am I the only one that seems to be having trouble with item drops? I suppose it is still early, but I’ve been through the tasks a couple times and still don’t have any books or visors for Geordie. I understand the whole drop rate thing, but usually I’ve managed to at least get started by now. On a related note though, I love the requirements for him: Reading Rainbow. First off loving the event. I think it isn’t good that the Enterprise will disappear. I mean yeah we get to keep all the rooms that we bought but they are going to look stupid in the middle of Quahog. Why would you have a random robotics lab with no walls in the middle of an area. At least on the Enterprise the rooms sit in the correct context. Is anyone else having problems with the drop rate on Red Shirts for Peters outfit, it’s supposed to be a common item but Chris has dropped a single one yet and I’ve put him on that action around 6 times now. Wondering why Chris is the only one dropping red shirts for Peters costume. Read on the tips posted by Facebook that the national bank drops them but my bank doesn’t even show it as a chance. Robotics Lab and Chris Hula Hoop is all we have confirmed and what TinyCo confirmed. Check the Turbolift on the Enterprise. That is where majority of his tasks are. I no longer have Tribbles spawning on the Enterprise, and I am only on An Officer And An Idiot Part 5. Where is the quahog fine arts preschool ??? No its not a post for this but im lostttt ! Preschool? Do you mean the school of Performing Arts? I fully and completely agree with this sentiment. When I scrolled over and saw that he was listed I could not stop squealing. My partner has already authorized me to use any money necessary to get him, haha. Also… check the tasks. Ones with Star Trek emblem take place on Enterprise. Anyone know what the green cubes Bonnie is dropping are for? Completed the 200 tribble challenge and no 20 donuts, but worse than that no new tribbles in quahog or enterprise since then…what’s up with that? Contact them about the Clams please. As far as Tribbles, hang in there. I know Bunny! Lol. I was just teasing And looking around for donuts. The enterprise won’t remain? Isn’t that a little ***** since we are basically buying things (with clams) that will dissappear after the event? Will we get some kind of in game conpensation? I love this event and want to have everything and all the characters… but if they are all going to disappear after 40 days well that grinds my gears. So is this a pretty good indication that StarWar aint gonna happen? Im pretty sure that if u guys have a choice u woulda choose to do the Starwar over Startrek any day am i right? i think that now disney bought the franchise thats gonna make it difficult to get the ok to do it and that disney is also notorious for not letting people touch anything thats theirs. This is all just my guess but then maybe u guys do have the ok to do it and are waiting till the movie come out. I really hope thats not the case cuz its gonna be a while till the movie comes out. About a Star Wars event, I don’t think it will happen now that the mouse owns the franchise. I doubt if they would let a controversial snowlike family guy come within 100 yards of Star Wars now. Who really knows though. Thanx and have fun. With all the Enterprise-only tasks, given that the Enterprise will be leaving at the end of the event (even if the rooms we buy will stay), I’m wondering how they’ll handle that. Riker, for example, isn’t going to be much fun if he only has two tasks, after all… I’m wondering if they might fold this into the Next Gen cast member episode somehow, and have us come out of this with not the Star Trek characters (Riker, Data, etc. ), but their actors (Frakes, Spiner, etc.). They already have Patrick Stewart, after all, and that would allow for a Cumberbatch Khan skin.